There’s something about group dances done well which is positively mesmerizing. When a number of people can work in perfect synchronization with each other, all playing their own small part in a well-oiled machine, it makes for brilliant viewing. Those seeking an example of what I’m talking about need only look so far as the Dodge City High School, who were chosen to host the 76th annual Tournament of Champions. Sue Kidd, a fan of the drill team, wrote on the school’s Facebook page: “A bit of background for Dodge City HS, located on the western plains of KS. Total enrollment is 2000 students, 81% are minority and of that 76% Hispanic, and with low unemployment in the community. 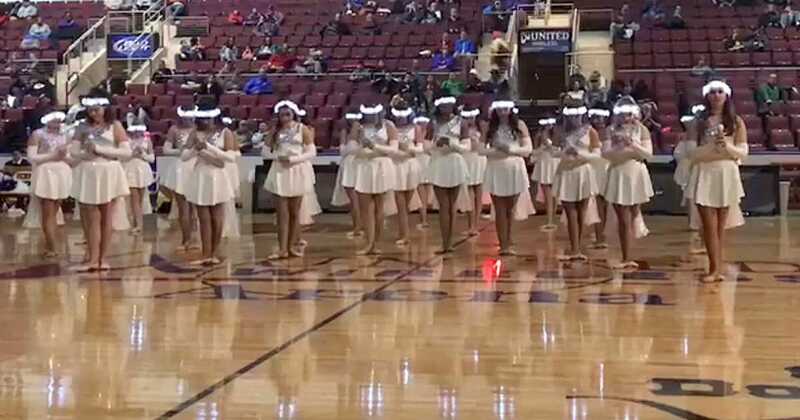 Naturally, there was an abundance of shows performed in-between games and at half-time, but none of them came close to Dodge City’s drill team. You see, making the finals was a big deal for the school, so their team had gone to great lengths to ensure their dance lived up to the occasion. Which is why hearts dropped in the audience when the lights suddenly went out. Wearing lit up crowns, and capes that were actually wings, the dancers adjusted when the beat switched from a soft ballad to a thrilling remix, with light show and all. If you were impressed by the routine, share this article on Facebook!